On Approaching E.B.C you may not exactly recognise it as your standard English beach side fish and chip and hut and that is because it is anything but standard. From the outside you could be forgiven for thinking it looks like a bizarre, large, brown, irregular shape which mildly represents a wave. Designed by architect Thomas Heatherwick, the building has won over 20 national and international awards for its design and architecture. 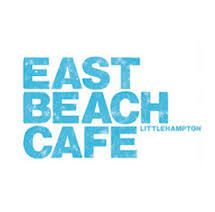 E.B.C regularly appears in different versions of the top ten beach restaurants in the UK, beating many in the more traditionally popular spots in Devon and Cornwall. This old fish and chip hut has been spectacularly transformed. Inside I kind of had the feeling of being in a cave, but a large bright, white cave with wonderful sea views. The menu does that lovely thing of strongly nodding towards traditions like fish and chips and burgers but punctuating the classics with some slightly more adventurous dishes like a seafood risotto or pearl barley risotto. The food is uncomplicated, with a promise of the fish being caught locally and all other produce where possible from the immediate surrounding area. So I chose something on the less traditional side and by chance my amour chose the super traditional option. I had pan fried sardines with seared beetroot tomatoes and olives and he had traditional beer battered fish and chips accompanied with pea puree and tartar sauce. My sardines were delicious, the fresh beetroot tomato sauce was full of flavour, setting the sardines off perfectly. I was offered a bite of the fish and chips to which I obliged, honestly incredible the freshest fish in the lightest non greasy batter physically possible, a good portion of peas, with a great dollop of tartar. You know normally after you eat fried food, that sleepy, really full feeling comes over you, not with this fish and chips, the best fish and chips I have tasted in forever. Luckily the portion was rather large so there was no excuse for me not to dig in. I really enjoyed my sardines but the fish and chips were truly next level. Desserts follow the same idea as the mains from a traditional sticky toffee pudding to an apple and pear tartin. As well as a large display of fresh cakes and biscuits. We shared a caramel slice, a dreamy end to our trip to the seaside! We needed somewhere beyond special in the Gloucestershire side of the Cotswolds to celebrate the last few days of a best friend’s unmarried life. 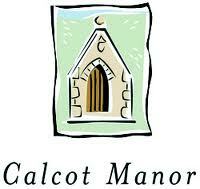 Calcott Manor seemed to be the obvious choice. Located in the small village of Tetbury, it is surrounded by rolling countryside and known for outstanding food and a tranquil spa. This manor ticked all the boxes. After a slightly stressful, sticky drive from the city, I quite literally fell into the arms of Calcott. It is the kind of place where you feel instantly relaxed and very much at home. Our rooms were beautifully decorated with real country elegance. After a quick freshen up it was straight to the Conservatory Restaurant. There is another dining option which is slightly more casual – The Gumstool Pub – a menu packed with all the classic British favourites such as shepherds pie, fish and chips and the Calcott burger. If the conservatory food is anything to go by, I’m sure the Gumstool does more than justice to those British classics. The Conservatory is for fine dining and we definitely dined finely. The menu was mainly British inspired, with some interesting European touches and good use of seasonal produce and ingredients from the surrounding area. I had been recommended the scallops to start, sauteed and served with Jerusalem artichoke, bacon jam, white balsamic and treviso. They certainly did not disappoint. For main, I went for the daily special, a fresh Salade Nicoise with strips of tuna steak. If I do say so myself, I make my own mean Salade Nicoise, out of habit always using the canned version. This salad blew mine off the table, it was super fresh and had the right balance of egg, potato and tuna, and speaking of tuna, the steak was tender and cooked to perfection. I will probably never make my own Salade Nicoise again! The finale, my favourite, a dark chocolate torte and Calcott’s was rich, strong and bitter, exactly how it should be. the Mille Feule was another highlight much lighter! A wonderful country retreat, you don’t always need to leave England to have a holiday, sometimes the best ones are the British ones! An English bank holiday in Suffolk! Southwold to be precise, affectionately known as Notting Hill by the sea. When visiting a new place there are always certain things that you simply have to do/eat/drink. Southwold is no different. You simply must take a stroll on the pier. Artist Tim Hunkin has created a number of wild and wacky slot machines an. simulator rides, there are no prizes, except the experience you have. You must have fish and chips, you must try the local Adnams beer and you must enjoy an afternoon tea. For this I would suggest Magpie bakery, the sea salted caramel brownie in particular. So say you have fish and chips on the promenade at lunch then mid afternoon you start to asses the dinner possibilities. The options are quite wide, after politely diving into 4 different gastropub/hotel vibes to check the menu and vibes. I count myself as officially being able to say if you go to Southwold you must go to The Lord Nelson, it is synonymous with the town. I would go as far as to describe it as its very own heartbeat. From the moment you walk in, you feel welcomed and excited by the vibe. 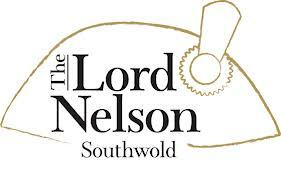 Winner of many Pub awards, The Lord Nelson sits in the centre of Sassy Southwold and right on the coast. The kind of place where if the walls could speak, the book would be epic. Early May Bank holiday the pub was bursting at the seams, instead of being annoying this just seemed to add to the atmosphere. However with regards to eating, you need a table to eat and the way you get a table is by swooning in on one when and however you possibly can. Reservations or queuing mean nothing to Nellies. We played a tactical game of working out who were furthest along with their meal, who are competitors were and what zone they were marking. This seemed to work and after one drink, we had a table for 2 in the snug. The menu is traditional, wholesome pub food, with all the favourites including; fish and chips, venison sausages, curries and burgers. To start I had the soup of the day, freshly picked asparagus from the field down the road, delicious! For main I had beef chilli nachos. Ok so not entirely authentic to Mexico but so wholesome and tasty I really didn’t mind. The standard Chilli con Carne was also a great option served with rice, sour cream and a separate plate of extra nachos. The burger was insanely large with a brioche bun, my favourite and the fish and chips seemed to go down a storm as well. As I was considering finishing on a high, I heard hushed tones from the table next to me, ‘they do awfully good desserts here.’ Sticky toffee pudding it was and very true, an awfully good dessert. A trip to Southwold would not be complete without a visit to The Lord Nelson, I can’t image what more you could want from a Suffolk pub on a bank holiday. The Hut on the Isle of Wight, what are you thinking? A small wooden shack serving plain sandwiches and walls ice creams? Think again. The Hut is located in Colwell bay near Freshwater and a stones throw from The Needles, the best part about the hut, the best way to arrive is by boat, weather Simon Cowell style super boat or smallest floating device you can find. I arrived courtesy of a friend’s valiant rib. We let down the anchor and were escorted ashore by one of the owners (YOU HAVE TO MAKE A RESERVATION) this is a small beach which you can imagine used to be low key and fairly undisturbed with a hut providing cold drinks and ice creams. That hut has been turned into something special; I kept making comparisons to Mediterranean equivalents. Most of the seating is outside, everything is whitewashed with glimpses of blue in the logo, water glasses and plates. The actual hut has been kept perfectly simple but with wonderful attention to detail, the door handles are large knots of robe the pull cord light switches have a beach hut on the end, the cutlery is served in a perfectly sized brown paper bag with the blue hut label stamped on. The menu is similar to the decor, simple yet exactly what you fancy. It is dominated with seafood, mussels, crab, prawns and lobster, alongside meaty favourites ham hock for starters and a classic burger or pork belly for main. I went for gazpacho to start and half a lobster for main but as usual tried tasted a few others from either side. You cannot wrong with the lobster served with garlic mayonnaise and real chips. Washed down with a supreme Italian prossecco, take me BACK. The desserts didn’t blow me away; I had raspberries in white chocolate sauce. We arrived at the restaurant at 1:30pm and didn’t leave until 5pm that has to be the sign of a fantastic dining experience. Even if you have to row from the mainland this place is worth it. An incredible privilege that every time we go out there is somewhere new and interesting to try, the list is endless so how do you choose? Here I help you. I choose carefully, so trust me. I love food!